Just like the status of India in the world of football (SOCCER, yet to fly their flag @FIFA); the Indian universities are yet to make any mark in the academic world. Why.. why.. why is it that none of the Indian academic institutes have made it to appear in world's top 200 rankings; consistently in the past 3-years. The idea of this post is to bring out the bare facts and also to offer my own personal views for this pathetic show in the academic arena. Arena?? ?, is it a good word, are we saying that the academicians need to be in a race; while many people shrug aside this topic calling it to be a meager "rat race". No, its a measure of where does the institution stands in imparting education and performing research, in a way it reflects on the worthiness of everything; YES, it is indeed to make one realize whether the students one trains, after all have to enter the ARENA and hence the correct word. As we wind up the year 2013 (today being the last day); we learned 2-reports, first, the Indian Universities faring badly among the BRICS countries; next, a miserable performance among the World Rankings. Lets analyze the first work done by the TIMES higher education UK group in gauging the academic institutions among the FIVE (Brazil, Russia, India, China and South Africa) major emerging national economies. 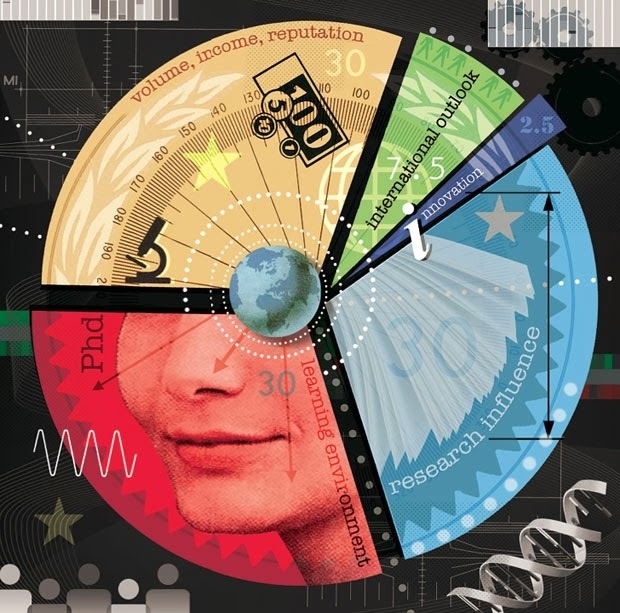 The assessment seems to have been based on four major issues (complete details): While 1. teaching (30%), 2. research (30%), 3. citations (30%) carry a large chunk, the remaining 10% is calculated upon the industry income and international outlook. In addition, there were 13-carefully calibrated performance indicators; trusted by students, academicians and industry and governments. There is a minimum bar of around 200-published papers an year starting from 2007 and the institutions must teach undergraduate programs; with few exceptions permitted. Coming back to what Indian universities have done among BRICS: while China grabbed 4-slots among the top-10 (including 1st, 2nd); Punjab University was placed at rank-13 (we are NOT averse to this number!!). The other institute to represent India is IIT-Khargapur standing long long away at 30. There are 6-more institutes (so, 8-among 50) within the 50-bracket; the notable one being Jadavpur university at 47 and Aligarh at 50. Lets get some opinion from Phil Batey, editor, Times Education Higher Rankings, UK; as per his interview appearing in the Hindu, he attributes the no.1 slot for Peiking university is primarily due to research impact and industry income along with an excellent teaching credentials. As per Batey, the Chinese government made a significant effort starting from 1990 and pushed for a few number of highly specialized universities into world class level by pouring a significant amount of grants in developing infrastructure and research facilities (Is anybody listening ???). The decision, a political, but very aggressively followed in attracting the reverse brain drain by offering a variety of incentives to the students, faculty coming back to their motherland. While the Punjab university seems to have done exceptionally well due to their research program; which is "globally potential". Commenting on the poor performance of IITs, Batey says IITs lag on research front. He also mentions very categorically that the funds flow towards education is poor in India and hence a poor set of infrastructure in all the educational institutes. Some other good universities were not appearing in the list as they had not participated in their ranking procedures (e.g. Delhi University). The simple logic of "what you sow is what you reap" is applicable. As Mr. Batey pointed out, the other developing countries who have made it big are the ones who have spent an enormous amount. It is interesting to come up with the actual numbers spend based on GDP among the BRICS. Though the recruitment procedures are very fair at the central universities and at the IITs in attracting bright researchers from abroad and within the country; what has been noticed is that of terrible deterioration in the research performance of these young faculty after joining. It is absolutely clear that the major reason behind this phenomenon is due to poor infrastructure on pursuing research mixed with many other non-academic reasons which will kill the remaining enthusiasm. While, the lack of funding is playing a detrimental role in the fall of quality research in India, the drying up of faculty strength is another crucial factor in the dwindling scenario of university output. There is a huge uncertainty in the governments to last their 5-year terms; and hence very few long term plans are envisaged in setting up of a esteemed places of higher education. Can we not identify universities of excellence which can offer world class teaching along with cutting edge research, the ISERS is a good move in this direction. Let us reinforce IITs on their research front; let there be few faculty who are taking less burden of teaching, but performing research alone (assessed by an independent body). No point in spending a fortune on attracting one type of fellowship (calling noble laureates); instead we can call many without the tag. Let there not be an aversion on PRIVATE universities (they are the ones who sent the first probe into the space), if they are bringing competitiveness let us have them into the foray; after all the new entrants need to be wary; not the other way round. On the occasion of 60th formation day of UGC, Prof. C. Raj Kumar, vice chancellor of O.P. Jindal Global university has come with a good discussion (the Hindu) on "Building better Universities". 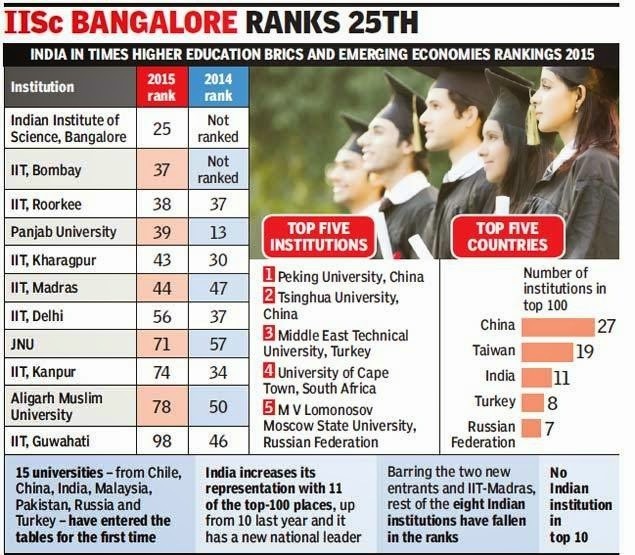 While very first table showcases a pathetic show of Indian universities NOT appearing in the top-200 ranks all along the the years 2011, 2012 and 2013; at the same time China, Japan and South Korea taking 4-5 slots on an average among the lists of various bench markings. Raj Kumar has gone in greater depth of the working model of UGC; his comment " The current framework that require universities to be constantly regulated by laws, rules, regulations, guidelines and policies set by the government and the regulatory bodies have not produced the best results". He emphasized on the issues of quality and accountability which need to be ensured by the regulating body (read UGC). As per this article; India in the pursuit of enhancing the education base (Gross Enrollment Ratio) has some how lost in spending on the research and scholarships. Here is another news appearing just now : LINK, that the findings of QS-World University Ranking system finds IIT-Bombay holding the best representation from India.... at 222; while few universities (Delhi Univ., Calcutta Univ.) managing to be in the 420-440 range. Indian universities stood up in the subject-wise rankings brought out by the same agency (reference: QS Rankings) where Indian institutions failed miserably as a whole. Listed here are the 9-institutions from India, which grabbed under-100 rankings subject wise.. I fully agree that we must provide complete freedom and autonomy to the educational institutions. But the basic issue is FUNDS.... where are they.. they all have dried up. As was clear from the way the neighboring countries have performed; one need to literally pour huge amount of sums to raise the infra structure and attract the bright minds (within and from abroad). Mere funds would not solve the problem. In my view there are many intangibles which plague our education system. One is the complete indifference of teachers towards their responsibilities. I come from a small town called Guntur, in AP. I know how teachers in most colleges don't teach anything in the classes. They do that at their homes as private tuition. Every student is forced to go for tuition.This is at the undergraduate level. People go for teaching only as a last resort. As regards research, we have starved the universities by luring away the best research potential to the organised research institutes like ISRO, BARC, etc. (Today, of course, the UGC scales are good!). Look at the leadership of the universities. I did my M.Sc. from the Banras Hindu University in 1956-58. When I joined the VC was CP Ramaswamy Iyer, a great scholar and administrator (He was Diwan of TRavancore). At one time Dr.S. Radhakrishnan, our former President and a great scholar was the VC. And today? Most universities VC's are political appointees. Thus the disease is at the systemic level. No window dressing will solve the problems. First choose eminent scholars in various disciplines and form a panel. From there choose VCs and give them full freedom to act. Same thing applies to selection of professors. Etc. 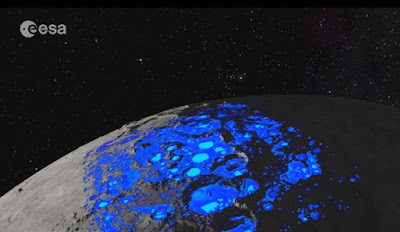 Lunar water; Who dunit ? ?